New mum, Cassie, gave birth to a healthy litter of ten puppies back in February. The pregnancy and birth were smooth and went to plan, but problems began when the pups were less than a couple of weeks old. Cassie became unwell. Her owners quickly realised she wasn’t her usual self and rang us at Quantock for Cassie to be checked over by a vet. Cassie had developed mastitis, a common problem affecting breast feeding mothers. In her case however, it was very severe. She had a very high temperature, was feeling very unwell and her mammary gland was hot, hard and painful. She was admitted to hospital for intensive supportive care and this meant she had to leave her young puppies. Cassie required surgery to fully remove the infected mammary gland and then required lots of bandage changes and supportive care to keep the wound clean. Despite all this, she made a full recovery and was able back home with her family and puppies. However, that’s not the end of the story. With mum being treated at Quantock, 10 hungry mouths were left at home needing regular bottle feeds through the day and night as well as lots of love and attention. 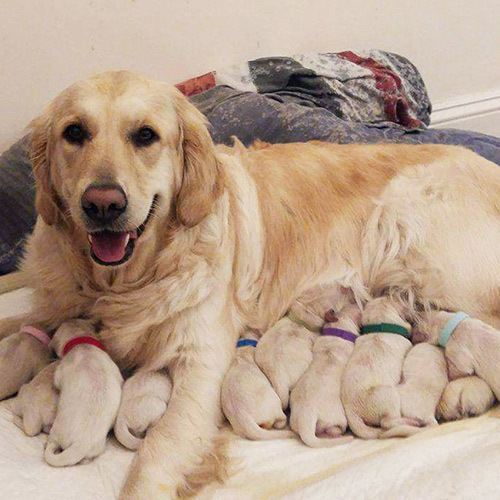 Cassie’s owners were quick to take up the role and stepped in as surrogate parents for the puppies, catering for all their needs. However, it started to become apparent that some of the puppies were becoming unwell. We think the milk they had drank from Cassie’s infected mammary gland before she was admitted to hospital had made them unwell. Over the course of the next couple of weeks several of Cassie’s puppies required veterinary care. The team at Quantock did a fantastic job of ensuring the puppies had the food, water, medications and the care and attention they needed to nurse them back to health. Meanwhile at home, Cassie’s family diligently cared for the rest of the puppies, and Cassie who was still recovering. As time went on the puppies became older, stronger and healthier and eventually went back home to their mum and the rest of the family. Sadly we lost one puppy, little River, whose illness became too much for her to cope with. 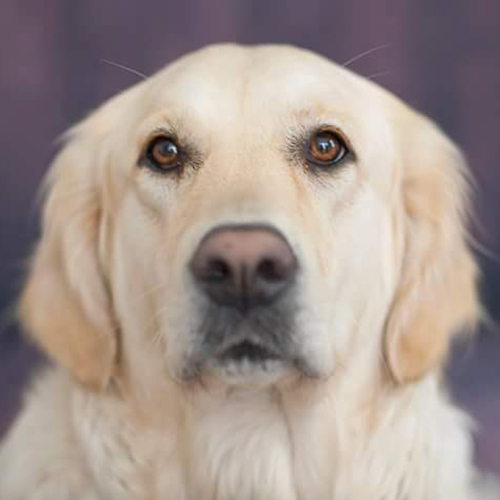 After a tricky and testing couple of weeks for Cassie, her puppies, Cassie’s owners and the team here at Quantock, we are pleased to say that a couple of months on, Cassie is doing well, and all the puppies have gone to their new homes. It is certainly safe to say that without the hard work and commitment of everyone involved the outcome could have been very different! It just goes to show, breeding a dog and having a litter of puppies is not an easy task. A lot of time, commitment and hard work is required to ensure mum and puppies are cared for through a difficult time (even if all does go smoothly!). Mrs Phillips, Cassie’s owner was so impressed with her wonderful dog “Cassie has an amazing temperament. Even with all she went through she remained a very good mum. Due to the circumstances she was away from her puppies for long periods however her bond with them was never broken. She added “Both Cassie and her pups received the best care possible from every vet and nurse at the practice. It was a difficult time for all of us but we received amazing support from old and new friends and we were rewarded with 9 beautiful healthy puppies who will enrich the lives of the new owners.” And having met those adorable puppies – we have no doubt of that!